Teenage girls launch a project to redefine beauty standards and it’s empowering. 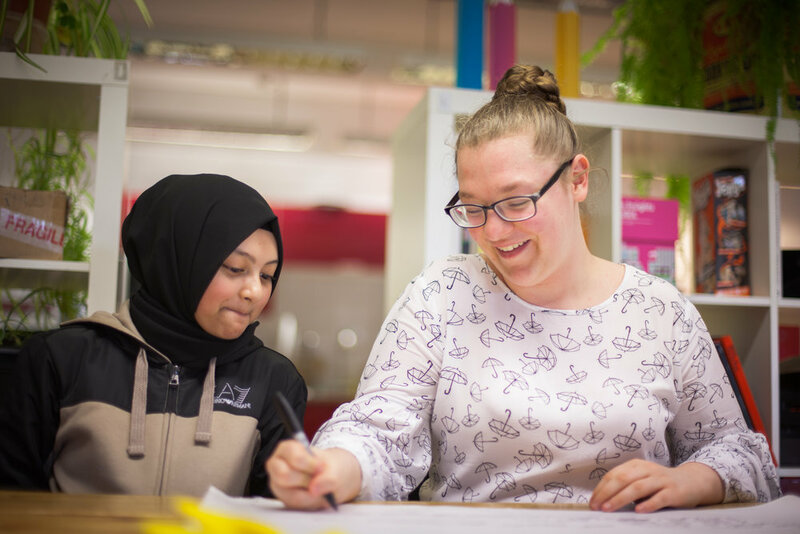 School 21’s take on work experience provide both student and their host workplace with something that is more meaningful and authentic than traditional work experience. Spending half a day a week in the workplace, for 13 weeks, Year 10 students are tasked with solving an authentic problem for a real organisation. The projects can take any form, as long as there is an authentic outcome that students are required to produce. It should be something that would be of genuine value to the organisation. With the help of Sisterhood, School 21 Sisters set up a pop-up design studio within Makerversity, a fabrication lab made up of Europe’s most exciting community of emergent maker businesses. Surrounded by inspiration and London’s most creative makers and thinkers the girls joined Sisterhood on our mission to boost confidence in young girls through creativity. Help girls feel comfortable with their natural beauty and create opportunities to see more realistic and diverse representations of women in the media. The School 21 Sisters have initiated a digital platform - We Recognise which aims to use the power of storytelling to celebrate and encourage natural beauty from diverse cultures; thus reframing the unrealistic standards of beauty represented in the media. Students from School 21 invite you to the launch of We Recognise — a digital platform that uses the power of storytelling to help girls embrace natural beauty from diverse cultures. BBC Radio 4 broadcaster visits the School 21 sisters at the studio to talk to them about how to pursue a job you love and asks the girls about their experiences working in the creative industry. These kickass teenage girls have launched a project to redefine beauty standards and it’s so empowering. Normal to Dissent Exhibition | Central Saint Martin - Lethaby Gallery. Emma Kennedy discovers why so many people in Britain hate their jobs and identifies ways to help them find careers that better suit their talents and aspirations. Our latest podcast, On Being A Teen Girl Now, is full of gems about life as a teen today. Great advice from our guests, 16-year-old Leah and 15-year-old Divaina, to remember that communications is critical between parents and teens. On 12 September, School 21 students with the support of Sisterhood, a social enterprise that deliver creative programmes to build confidence in young girls 13-17, will be transforming Rich Mix for an evening of conversations and activities on the power of creativity to challenge and create culture.